I’m sure that by now you’ve heard of the clothing company Stitch Fix. The company has gained a lot of popularity over the past couple of years and it looks like there’s no stopping them! The premise of Stitch Fix is simple. As a user you fill out a profile with your style and price preferences. You’ll then be matched to a personal stylist who will hand pick five items of clothing for you. You’ll be charged a $20 stylist fee and the items will be shipped to you. You then get to try on everything and decide what to keep, if anything at all. You can buy the items you like and send back the rest. If you decide to buy anything out of your “fix” you’re credited the $20 stylist fee. An easy and fun way to get new clothes, right? It turns out that Stitch Fix may also be a great place to find a work from home job. Here’s how to become a work from home stylist with Stitch Fix. Stitch Fix hires stylists to work at home, but not just anyone qualifies. To be considered a good fit for this position you must have an interest in fashion, be detail oriented, client focused, be able to manage your own schedule and be at least 18 years old. To get one of these jobs you’ll first need to submit an online application. If you’re called for an interview you’ll put together a secret Pinterest board for a fake fix. During the interview you’ll write about the pieces you’ve chosen as well as do some in-person styling. You’ll also be asked regular interview questions. 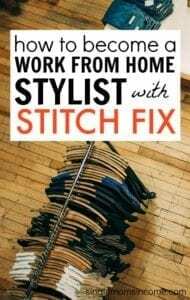 Becoming a Stitch Fix stylist appears to be a great opportunity for someone who loves fashion, needs a work from home job and lives in one of the designated areas. If you think you’d be a good fit as a Stitch Fix stylist you can apply online here. really interesting unluckily living in Italy is not possible do It for me!!! Yeah, that’s too bad 🙁 It does seem like a pretty interesting gig. I live in Marion, OH, which is a couple hours south of Cleveland. In order to become a stylist, do I need to live in the Cleveland area or is in the same state ok? There is initial training done on-site before you can work at home so you’ll need to live close in order to complete that.